Here’s one of the Outer Banks’ best kept secrets: there is so much to see and do after fall. 1. Interested in surfing? Great waves come with chilly water in OBX. This may come as a surprise, but the winter months (especially February) on the Outer Banks are known to be prime time for getting out on the water and surfing! Of course, you’ll want to prepare and be realistic – follow professional tips on best conditions and staying warm. 2. Fishing during this time of year can be an avid fisher’s dream. Winter time means crowds are at a minimum, but the fish are aplenty. From offshore charters to pier fishing at Jeanette’s Pier in Nags Head, you’ll find that you’ve never had a better catch than in the colder months. 3. Get a quiet escape filled with beautiful scenery. Some mornings you can have the beach all to yourself for a gorgeous sunrise, or the bayside shore for astounding sunsets. Stargazing at the dark winter night skies is something you’ll surely want to experience - the Outer Banks is known for being one of the best locations on the east coast to find clear nights without bright city light. 4. 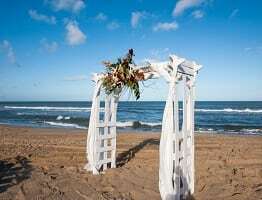 This is the best time to plan your Outer Banks destination wedding. The Outer Banks Wedding Association hosts their annual Wedding Weekend + Expo in January, this year from the 19th-20th. This is a must-do for those looking for the perfect venue, event space, vendors, and more. 5. There are plenty of museums and historical landmarks open year-round. The Outer Banks offers some amazing learning experiences and local history. Bring the family to see the Wright Brother’s Memorial, the Graveyard of the Atlantic Museum, or climb the many lighthouses from Corolla to Manteo. Just check winter dates & hours before you go. 6. Explore the hiking trails and outdoor adventure on a cool winter day. Hike the sandy dunes of Jockey’s Ridge in Nags Head, the Alligator River National Refuge in Manteo, or jog along the peaceful Nags Head Woods Nature Conservancy (see our blog on this hidden gem). The great thing about getting out to see these secluded parks during winter is beating the heat! 7. Visit your favorite restaurants without waits. The Outer Banks is filled with great dining, which usually has locals and vacationers competing for parking spots and tables. Stay this time of year and you may not experience this ever again! Check this comprehensive list to see where you can dine in January. 8. Of course, we can’t forget the tranquil and secluded beaches. Unlike during the busy spring, summer, and increasingly popular fall seasons, the OBX beaches will be uncrowded. Plus with average January/February days having highs of 55 degrees, sitting on the sunny beach won’t require an umbrella. In short, the only thing “off” about this season is the heat and the crowds! There’s also so much more to see and do that we didn’t mention. We encourage you to write a must-do list of your own, find your accommodations, and have a great winter vacation. Picture this: You’ve made the trek through North Carolina, thinking of the sunny and sandy coastal environment that lies ahead for your OBX beach vacation. You and your family have been coming for years; it’s an annual tradition that cannot be missed, yet you also like the idea of exploring another type of getaway. Nobody has all the vacation time they’d like to, and so you use your time away go to the place you know you love to relax, where you can sit amongst the crashing waves. But somewhere more secluded, like the woodsy outdoors, sounds intriguing. “The beaches are great, but I’d like to see a different side of North Carolina”, you say. Perhaps an adventurous national park visit with biking and hiking piques your interest, and suddenly you realize the way your headed is a few hours too far from that different side. What to do? The better question is where to go. Get ready for a surprising answer - stay headed towards the famous sand dunes of Nags Head and Kill Devil Hills for just what you’re looking for. No, I’m not telling you to just go hike the well-traveled Jockey’s Ridge dunes! 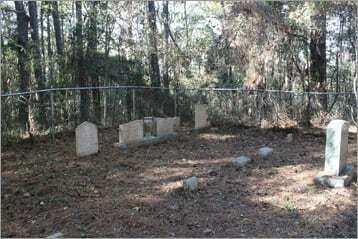 I’m talking about a place hidden in plain sight right next door: the Nags Head Woods. Here lies that alternative you’re looking for. 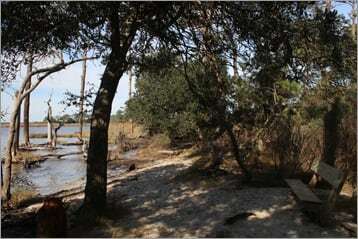 The Nags Head Woods will have you immersed in a forest filled with vegetation, towering trees, beautiful ponds and marshy landscapes that’s so different from the surrounding environment, you’ll wonder how you’re still in Nags Head and literally right next to the famous dunes. It’s a place that I have come to love going to for a complete change of scenery, and change of pace. Officially known as the Nags Head Woods Preserve, the Woods offers such a different experience from your expectations of the Nags Head environment, and that’s why I love it. The beach that you came for is right across the way, but you also have the choice of a forest hike on the sound-side. Talk about that different side. I walked along one of the trails with my two daughters recently, on a day where we could see frogs hopping along with us and into the ponds of the wetlands that lead out into the Nags Head sound. We gazed up at huge trees that surround you as you find your way along, unlike the open views we would typically see of the not-too-distant oceanfront. My girls loved getting to explore the trail together, and I realized what a great place the Woods are for a family day. With so many tourist attractions and fun things to do in Nags Head/Kill Devil Hills and throughout the OBX, so much time can be spent at these man-made places of interest. Trust me and save the go-karts, mini-golf, and waterpark trips for another day and visit the Preserve when you get the chance. Here’s my perspective: the beaches are a place to play together, but the trails here bring a different edge to traveling together. There’s something about exploring an unknown path for the first time and hiking through the outdoors that bonds a group in a way only nature can do, and these woods have that something. After that time with my girls, I found that walking those trails together is such a great way to get that bonding time Outer Banks family vacations are supposed to be about. If you’re looking to spend a day adventuring with your friends or family, I recommend just taking a walk through this beautiful area. 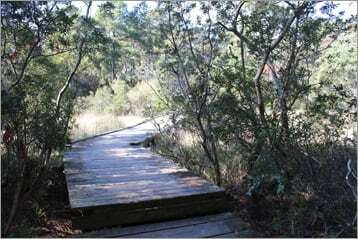 Walking along the trail is also key in the Woods to not disturb this designated National Natural Landmark’s ecosystem. It’s not only protected natural park land with a variety of plant and animal life, but also a place of historic significance, having artifacts such as brick foundations of a 19th century building to discover along your journey. In fact, here’s a word of warning – biking is not allowed on the natural trail paths in order to protect the land. Don’t worry though, you can still bike or walk your dog on the gravel roadways within the Preserve. It is a great area for recreation, so pack some water and bring the pet or bike with you. 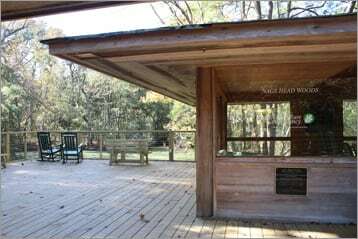 The Nags Head Woods Preserve has something to offer anyone, whether you are that beach-goer looking for something different or even if it’s your first time visiting the area. I’ve just scratched the surface of what this natural attraction has to offer, so I hope this encourages you to go explore the Woods and check it out for yourself. Better yet, I hope you look for other different locations in the Outer Banks to visit and vacation at. There are a lot of hidden gems with truly unique experiences that even the most experienced of OBX travelers can be unaware of. When I think about my favorite spots in the Outer Banks, it’s hard to remember any that are more beautiful and tranquil than Coquina Beach. A hidden gem among an already scenic beachfront coast, Coquina adds a unique flair to the OBX aesthetic with its colorful surroundings and how it hides away from the community around it. I enjoy this beach for its naturalness and undeveloped perimeter, but also for the blues of the ocean and greens of moss-covered rocks during low tide that separate it from all other local beaches. Its name originates from the colorful clam shells found along the Outer Banks, and the beauty of this spot really does do the name justice. My visits to Coquina have provided a feeling of escape into a secluded paradise-like environment – a nice change of pace during the busy summer season in the area. I feel this escape even though its location could hardly be more travelled, and ideal; Coquina is located in between Nags Head and Oregon Inlet along the Cape Hatteras National Seashore, practically between it all if you’re looking to explore OBX as a whole. Needless to say, Coquina is easy to find and not at all a secret hideaway miles away from civilization. If you’re looking for a relaxing, clean, and comfortable beach visit, look no further than this favorite of mine. Explore the year-round options on and around Coquina, whether that means fishing, visiting nearby historical attractions like the Bodie Island Lighthouse, beachcombing for gorgeous shells, riding the water, and more. Most of all, I recommend enjoying the peaceful retreat Coquina offers. Yes, it IS an art. Your spouse wants to be near the Sound, so he can bring his boat and/or do some fishing. The kids want to be close to the beach. Your parents and/or in-laws just want peace and quiet. The only totally agreeable one in the whole bunch is the dog. BUT, with a little patience and planning, you CAN make everyone happy. When you know WHO is going on vacation, you can more easily choose the accommodations. Kids? You’ll look for a property with a separate play area or at least some games, puzzles, movies, etc. Less-mobile people? You’ll look for a single-level property or one with an elevator. When you know WHAT you want to do on vacation, you can create rough plans. Want to bring the boat? You’ll look for a property that has a dock. Want to see the local sights? You’ll look for a property that’s centrally located. Sun worshipper? You’ll look for a property within walking distance of the beach. Knowing WHEN you want to go on vacation, well, that’s pretty self-explanatory. WHERE you want to vacation can mean a lot of things. Ocean side, Sound side or between the highways? Hatteras, Corolla or somewhere in between? Laid back South Nags Head or vibrant Kill Devil Hills? Good communication is the key to manage this factor. WHY may sound weird, but it’s actually very relevant and important. Your WHY might be to relax, recharge and enjoy some “us” time with your spouse. Your spouse’s WHY might be to sit on the dock with a fishing pole, soaking up lots of “me” time. Your kid’s WHY might be to lay out in the sun, go shopping and climb Jockey’s RIdge. Your parent’s or in-law’s WHY might be to read, paint, go for walks and enjoy some peace and quiet. Managing all these widely varying WHYs (or expectations) is the key to whether you will enjoy a harmonious vacation as a family or a chaotic mess with lots of hurt and disappointment. Make sure you choose the right vacation rental company. It should have enough variety in properties to find the right accommodations for your group. But, it shouldn’t so big that you feel like nothing more than a reservation number. Make sure to read their policies and procedures and determine if you can live with them. Trust us when we say if any conflict arises, those policies will be the first point of reference and if they work against you, well, you may just be out of luck. Here’s another thing to consider: What types of innovations does your rental company feature? Are they always striving to bring a better experience to their guests? Do their online reviews reflect timely and positive interactions? KEES Outer Banks is leader in Guest Experience innovations. From our FlexStay program to the provision of linens and towels in all properties to our Beach Cabana Service, we are all about creating an exceptional vacation experience for each and every guest that books a reservation with us. We know that our guests are our lifeblood and we will do everything in our power to keep you pampered, thrilled and returning to us. In this era of information overload and the entire world right at our keyboards, it’s easy to think we’ve got everything in hand. And for the most part, we do. It’s incredibly easy to log on to any vacation rental website. To narrow down our almost endless choices with the parameters provided - dates, location, number of bedrooms, pet-friendly, etc., etc. You will undoubtedly find a minimum of 3 or 4 choices to fit even the most well-defined criteria. And that’s when the confusion starts. Which one is best? Which will my family like most? Here’s a novel thought for you. Pick up the phone. Dial that toll-free number listed on the top of the website. And ASK. That’s why the reservationists are there. They have been in the properties and they can offer their first-hand opinions on each of your possibilities. And here’s the best part. They really LOVE helping guests choose the right accommodations. They GET that it’s a big deal. They GET that it can be scary and you’re afraid of making a mistake. Take advantage of their expertise and wealth of knowledge. So, pick up your phone and dial that toll-free number. You will be glad you did. Yes, we get that the rules and regulations set up by the rental company are pesky. We get that it’s your vacation and you don’t want to follow a bunch of rules. But those rules are put in place for the safety and security of all of our guests. They’re not just arbitrary. a. Arrive at check-in time. If your check-in time is 4:00 pm, don’t show up at 2:00, with perishable groceries in the car. Your rental company isn’t doing this to be mean to you. They NEED every minute of the turnover time to get each property cleaned, inspected and ready for the next tenant. They really want it to be perfect for you. b. Check the functionality of the property and its amenities when you FIRST check in. Most importantly, if something is wrong, SPEAK UP. Your rental company really does want to know if a piece of furniture is broken or the pool or hot tub water is green. They want you to have a great experience. Don’t wait until you check out to tell them that something major was wrong. They will gladly send maintenance or housekeeping out to fix something. c. Don’t treat your vacation home as Party Central. Your rental company absolutely wants you to relax, cut loose a little bit and have fun. But please remember that your vacation property is someone’s home and should be treated with respect. In the same vein, if occupancy is listed at 10, please don’t pack in more than that. If parking is limited to 4 vehicles, please don’t bring 5. Many neighbors have eagle eyes and missteps are usually reported. Don’t create a situation in which your rental company has to take action against you. It’s the last thing they want to do. d. At check-out time, please follow the few basic rules, i.e., lock windows and doors, start the dishwasher, take out the trash, etc. We know you’ve paid a cleaning fee and we appreciate it!! But we still ask that you do these few simple tasks so that the next renter can check-in to a clean and well-stocked property, too. e. Don’t hesitate to call if you want suggestions...for just about anything! Your rental company staff LOVES to tell you about the great stuff available in the area. So, you’ve done all your research. You’ve found the perfect property for your family. You’ve scoped out the area and know exactly what activities and attractions you’re going to take advantage of. And now you’re there. You’re on the Outer Banks!! And for the first day, you’ve planned the perfect day at the beach. You put together all the snacks. The car is loaded up with all the beach chairs, towels, toys, even sunscreen. You wake up that first morning...and it’s raining. In the above scenario, this development could spell disaster and frustration. It would have the end effect of casting a pall over your entire vacation. Please don’t let that happen. You’ve worked so hard to make this a wonderful trip and your family deserves to have an amazing adventure together. Instead, keep a running list, instead of a schedule, of the activities everyone would like to experience. Each morning, over breakfast, evaluate the weather and the general mood and make your decision from there. Maybe someone will come up with a brilliant idea you hadn’t even considered. This way, a rainy day just turns into a trip to the aquarium or a popcorn and movie day instead of a disaster. This one is simple. Don’t Facebook, Pinterest or Snapchat your vacation away. Put the phone down or at least in your back pocket on silent. Spend some time in nature, Take in a sunrise or a sunset. Go for a long walk on the beach and look for beach glass or that perfect seashell. Interact with your family in a meaningful way. Enjoy a good belly laugh. Maybe play a board game together. Throw a ball or a disc with the dog. Vacation doesn’t come around often enough and you’ll never have the same one again. At KEES Outer Banks, it is our sincere desire to be good community neighbors. We are homeowners and we are members of the Outer Banks community. Our roots are planted deep and we are here to stay. We all know that tourism is a way of life here. We plan our activities around the “season”. We just know that at certain times of the year, and certain days of the week, the roads will be flooded with vehicles, the stores with shoppers and the restaurants with patrons. At times, it’s an inconvenience. It can be frustrating and we understand this. Of course, we also understand the lure of the golden, wind-swept beaches and dunes and the warm, aquamarine water. We count ourselves blessed to call this fragile string of islands home. So many of us depend on tourism dollars for our livelihoods and know that we have to make our living while we can. Many of our neighbors choose to rent out their homes and/or condos through vacation rental programs or online services such as Airbnb.com, Homeaway.com or VRBO.com. There are several advantages to this practice. First, if rented through a professional management company, it’s helpful to have a local management company looking after an investment property. Particularly when the owner resides out of town. Second, it is favorable for overall neighborhood security to have a property occupied rather than vacant. Third, many times the rental revenue is needed for payment of mortgage, taxes and upkeep. It may be the only way the owner can afford to keep his/her property. Even with the most sound policies of potential renters and the best of intentions, sometimes there are still problems. Certainly, we are not attempting to gloss over or minimize our neighbors’ concerns or frustrations. Parking can become an issue in residential neighborhoods with vacation rentals. All of our vacation rental property descriptions clearly state the number of vehicles that a given property can accommodate. Each time we book a reservation over the phone, we remind our guests of the parking allotment for the property they’ve chosen. Unfortunately, vacationers don’t always understand the impact that just an extra car or two can have on an already fragile parking situation. Frankly, sometimes they don’t care. We find ourselves frustrated by this behavior just as we know our neighbors are. We know too well not all tenants take their trash out to the curb. We take this very seriously, as we know that this can quickly escalate into a health concern. Notices are posted in each of our vacation properties regarding garbage pickup, but yet again, they are not always adhered to. Because of the unique way in which KEES Outer Banks schedules rental stays, the trash day may or may not fall during a guests tenancy. Our staff regularly patrols our rental properties, with particular attention to garbage days. If a can is found full, it is brought to the curb for pickup. A team member will then return to make sure the can is put back in its proper place and not left at the curb. Perhaps one of the most frustrating aspects of being a year-round resident among vacation rentals is when tenants pack a property, exceeding its posted capacity. We absolutely share your concern and frustration. Septic systems are put at risk when overused. The noise level usually rises in accordance with the number of people occupying the home. We recognize that this is both a nuisance and a disruption to your life. Vacation homes with too many occupants exceed normal wear and tear and are at risk of outright damage. Since our first loyalty is to our owners, it is our duty and responsibility to properly care for our owners’ assets. When we have overcrowded properties, our owners and their investments suffer. We have addressed all of the above concerns because we want you to understand that we are fully aware of the issues that a small portion of our guests create. To that end, we are as proactive as we know how to be. Rules, regulations, home capacities and expectations are clearly noted on our website and in our properties. A member of our management staff is available 24/7/365. We urge our neighbors to contact us with any issues, concerns or conflicts that may come up. Team members regularly patrol our properties, from Corolla to Hatteras Island. We keep a keen eye out for too many vehicles at a property. When we find that situation occurring, we immediately address and resolve it with the guest. The extra vehicle(s) will be moved elsewhere or the entire group will be forced to vacate the property. Overcrowding is not tolerated. When we become aware that a group of tenants is exceeding the allowed maximum of a property, we immediately take action to rectify the situation, up to and including eviction. KEES Outer Banks offers a unique product to our guests. FlexStay is our solution to the horrendous weekend traffic on the Outer Banks and the evolving public travel trends. Instead of being another vacation rental company contributing to traffic back-ups and environmental pollution, we encourage our guests to arrive any day they’d like and stay any number of days that is convenient for them. We believe our FlexStay program is a win-win situation for all parties involved, including neighbors. At KEES Outer Banks, we make every effort to be the best neighbors we can be. We make ourselves readily accessible for any issues on a 24-hour a day basis. When we do receive a complaint, we handle it as soon as is practical. We choose to work in harmony with Homeowner’s Associations and other governing bodies in the neighborhoods in which we represent vacation properties. We respect and follow the regulations of every association. Our guests are made aware of any specific guidelines in the communities in which they are vacationing. In fact, we took the extra step of contacting local HOAs to make them aware that we are representing vacation properties in their neighborhoods. This was also to give them contact information and to reiterate that we are available 24/7/365 to handle any concerns or issues that arise. We strive in every way to have a positive working relationship with every individual with whom we come in contact. That includes the neighbors at the vacation properties we represent. Because we are your neighbors ourselves and we understand from a first-hand perspective the difficulties that can arise from having vacation rental properties in your neighborhood. Another topic we’d like to address is the misconception that our professional management services are of the same caliber as an online vacation rental site, such as Airbnb.com, HomeAway.com or VRBO.com. We can understand how an individual not familiar with the vacation rental industry may tend to put all vacation rental companies in the same category, but we would like to assure you that there significant differences. First, and most importantly, we are HERE. As we have stressed repeatedly throughout this post, we are your Outer Banks neighbors. 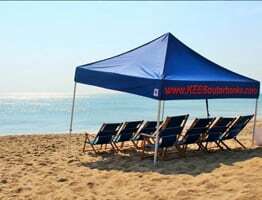 While it is true that KEES Hospitality is headquartered in Newport News, our KEES Vacation Division has their office located in Kill Devil Hills. All of our day-to-day operations on the Outer Banks, including our Maintenance and Housekeeping Departments, are performed by KEES team members who live year-round locally on the Outer Banks. Again, we regularly patrol all of our properties to be sure that guests are adhering to policies and procedures. If they are not, we address it then and there. If you find a problem with any of our properties before we do, we urge you to pick up the phone and call us, or stop by our office. We will be grateful to be made aware, happy to discuss it with you, and willing to meet you at the property if necessary. Second, we are professional property managers. This is not a hobby or a side gig. This is our livelihood. We follow the industry closely, we are up to date with all regulations in the industry and we’ve seen about anything a guest can throw at us. We are experienced and knowledgeable professionals with the ability to handle any issue that could arise. Additionally, and unlike most absentee owners, we have the means to handle any issue that arises. We have maintenance staff on call 24 hours a day. We have a dedicated housekeeping staff. We have existing relationships with a variety of professional, licensed tradespeople. We have trained management staff with years of experience. Absentee owners simply cannot resolve tenant issues in as efficient a manner as we can. Another misconception that we have become aware of is the assumption that we allow 1-night rentals. We would like to assure all of our neighbors that this is simply not the case. All of our properties have a 3-night minimum and we recently calculated that our average stay is 4.67 nights. We certainly hope that we have been able to put to rest any lingering concerns that our neighbors might have regarding KEES vacation rental properties in their neighborhoods. Please allow us the opportunity to be a good neighbor and we promise that we will do everything in our power to be a force for good stewardship on our beloved Outer Banks. - All linens and 2 bath towels per bedroom are provided.